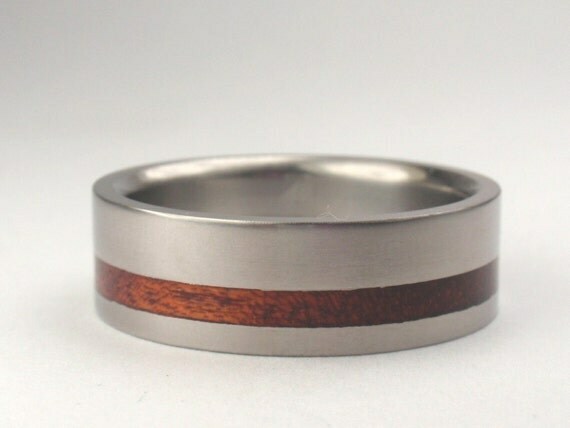 Johan’s wood-inlay rings first caught my eye on the etsy frontpage months ago, and every couple of weeks one of his new pieces pops up on my news feed. I’m eternally impressed with the beautiful consistency and high quality of his pieces. Enjoy as he answers a few questions about his art and his business. I love to create things others admire, it is a wonderful feeling, a high. It helps that I have an inquisitive mind and I am never afraid of starting/making something that others are not willing to try. I made my 1st ever ring when I was about 12 years old. I took a nut (as in the counterpart to a bolt) that was big enough for my finger to fit through, shaped it with a metal file into a signet ring. I never did wear it. I just had the inquisitive mind to do it. I have a “can do” attitude. I believe those that talk about it never succeed, only those that actually do it will succeed. I did a lot of reading and watching videos on the Internet. I made some rings and found it was easy enough if you know the material you are working with and how it will react when you work it.I have also received some formal jewelry manufacturing training, stone setting and casting rings, mainly for engagement rings with intricate settings. When I started selling on Etsy I started with a natural wood ring as no one else was doing it at the time. I made the hole with a little hand drill, filed the rest with a hand file, sanded and waxed it. I was pleasantly surprised that it sold in about 3 days. I thought that this was too easy to make money with so I made a lot of wood rings. A few months later I purchased a wood lathe to make the rings faster. A few months later I bought a very small bench metal lathe to make Titanium inlayed with Wood rings. This helped make the rings stronger as wood rings do break easily. Things happened fairly quickly from there. To date I have purchased 3 big metal lathes and a big metal milling machine, not to mention all the Jewelry tools and equipment. Now I can custom make any ring the client requests: Platinum, Gold, Palladium, Silver, Titanium, Meteorite, Damascus, Mokume Gane, setting of Diamonds and Gemstones. I have a Patent Pending ring I designed and manufacture out of Titanium. 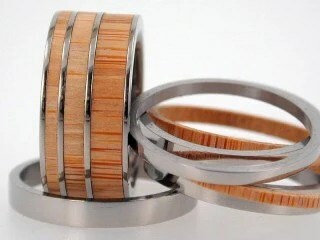 It is called the “Interchangeable Inlay Ring System”, some call it a “Hybrid Ring” [above]. You buy one ring and many inlays. You open up the ring and replace the inlay with another inlay. With this system you will have a new ring every time you exchange/replace the inlay. Some buy up to 10 different inlays, that is 10 new rings. With a normal inlay ring you are stuck with what you have and it usually costs hundreds of dollars. If something would break with a normal ring you have to throw it away, if it is a wood inlay, the wood inlay can break or if it gets wet it will eventually break as well. With my system you need only make a new inlay, replace the old inlay with the new inlay. Your ring is back to normal within days, at a fraction of the cost of a totally new inlay ring. My new patented inlay system solves many problems. I have many clients return and order new inlays from me. My current challenge is doing the same with Platinum, Gold, Palladium and Silver rings. It is very difficult but I will get it to work. A great challenge. If I cannot do it at first I will try and try again until solved. I love to design and develop new rings. To date I have designed 3 rings, 1 of them is Patent Pending. It is a great feeling to know that a ring exists because of you. It is such a great feeling when people congratulate you on your new ring design. What advice do you have for people looking to take up a new art form? Read up about it. If it interests you and you want to give it a try, DO IT. Don’t keep on thinking about it. Get some training if it is affordable and you have the time. With practice you will get better and conquer it. Everyone starts as a novice! How does one care for a wood and metal jewelry piece? I started making and selling rings on Etsy in June 2008. My beginner mistakes include not taking good photos. When I started taking good photos my sales picked up drastically. Etsy is my full time job. The amount of orders forced me to make it my full time job. My turnaround time has been between 4 and 6 weeks the last 2 years. It is currently 6 weeks because of the wedding season. My rings can be found on my website www.jewelrybyjohan.com. I wish I have the time to show my rings in galleries, I have been asked many times. If I get my backlog worked down to 3 days—it is currently 6 weeks because of the wedding season—I will consider sending my rings to galleries. My clients are King. I only provide the best service to my clients. Help them whenever you can, even if they are wrong. A disgruntled client has a negative impact on your business. Returning clients and word of mouth advertising are about 30% of all my sales. Invest in a good camera and only use good photos in your listings. My sales picked up a lot when I started listing with good photos. At first I used a camera with bad close-up, it made the items look small and distant. My new camera shows good close-ups and you can see all the detail. Make use of all the tags/keys available to you when you list a new item. Think like a client and enter tags that will get your items listed on the first page of search results. Search Etsy forums, they share lots of info on tags and search results. Search for listings similar to yours, how does yours compare to theirs, look at the keywords, price, tags, description, how far up on the search did they appear, etc. Later on you will be the person others search for and want to copy. You have to keep one step ahead of your competitors, be a leader not a follower. Oh yeah, that just happened. Well kids, once again life has gotten in the way of ye olde blog, so instead of coming up with new, original content for you, I bring you the words of one of my favorite bloggers (and full disclosure: very good friend), Mollie Shambeau. Miss Mollie is getting married in just over a month and I helped design her wedding stationery. She was kind enough to feature our work on her blog here. Her invitations were a fun project, both because she has an impeccable sense of style and wanted to add a little whimsy with a play on her soon-to-be last name: Busby (Bus-bee, get it!?!). Whenever I have a little down time , I try to pop over to The Mollie Shambeau Show to see what that girl is up to. One day she’s in Wisconsin, the next Australia, then Utah, then who knows! Just over a month ago now (jeez, has it been that long?! ), she wrote the loveliest post that expresses exactly why I chose to create greeting cards with my letterpress. On a day when life was handing me too much, I had dinner with a dear friend who brought such positivity to everything I blabbered on about, I really did intend to send her a thank you card just for being herself. And of course even I—with boxes and boxes full of beautiful ephemera—didn’t follow through on my intentions. The last few weeks have been a learning experience for me. Not only because I’ve been living in my parents’ basement (oh yeah) and planning a wedding that’s happening in LESS THAN THREE MONTHS (mini heart-attack) but because I’ve learned a lot about myself and my relationships with others. I vow to try my best to not take anyone in my life for granted. It began with a stack of cards. There are people out there (some of whom are probably reading this) that actually thought to send me a congratulations card after Sean and I got engaged. HOW THOUGHTFUL IS THAT? Seriously, it was so thoughtful that I started to question my own track record with cards. Lets just say I came up a little short. There is something to be said for “card people,” right? Are you a card person? Prior to recently, I was not. Thank you notes? Of course. Birthday cards? Maybe, if I was seeing the friend in person. Cards for lesser occasions (arguably the cards that really matter) like Get Well Soon, Thinking of You, Congrats, etc.? Er, no. Card people… how admirable are they? You know, that one person in your life who NEVER forgets your birthday, always calls, and makes sure you get at least one card (and $5 to spend on chocolate) on Valentine’s Day. I always thought to myself, “Maybe someday I’ll have time to be so thoughtful.” I resolved I was simply too cheap and too busy to embody the “T” word—two excuses that make me cringe as I write this. Plus, living in Utah a world away from many of my college and high school friends and family didn’t help to engage my sense of connection. Well “someday” happened, baby. It’s time I climb aboard the Thoughtful Train… and I would like to extend an invitation to you. I’d like to hope every woman reaches this point in her life. The point when she realizes that making that extra effort is important. Sure it may not be convenient to respond to an email or send a congratulatory card to a recently engaged pal, but you know what? Life isn’t convenient. I’ve got one hand on the computer keyboard and a sandwich in my other hand while I add, “Pick up dog poops in the yard” and “Write 1200-word story for the paper” to my To-do list and catch snippets on my iPhone from the Casey Anthony trial, all the while cursing my well-intentioned suggestion to watch “Father of the Bride” as tears of nostalgia run down my face (true story). Life isn’t convenient and it never will be. Going the extra mile for the important people in your life is—I believe—one of the most imperative and rewarding actions a human can take. Without friends and family in your life, would it be worth it? Think about it. Hop on the train. Send a freaking card ☺ And have a wonderful day!